Who will be the Scientist of Tomorrow? We are pleased to announce that Valentina is the winner of our undergraduate contest, ‘Scientists of Tomorrow’. The selection committee chose her entry out of 36 submissions received from Life Science undergraduate students all over the world. Valentina will spend one week this July at Nanolive’s headquarters in Switzerland to work on a live cell imaging project using the 3D Cell Explorer holo-tomographic microscope. At a first glance, you would think that Valentina had submitted a picture of an alluring exotic fish! 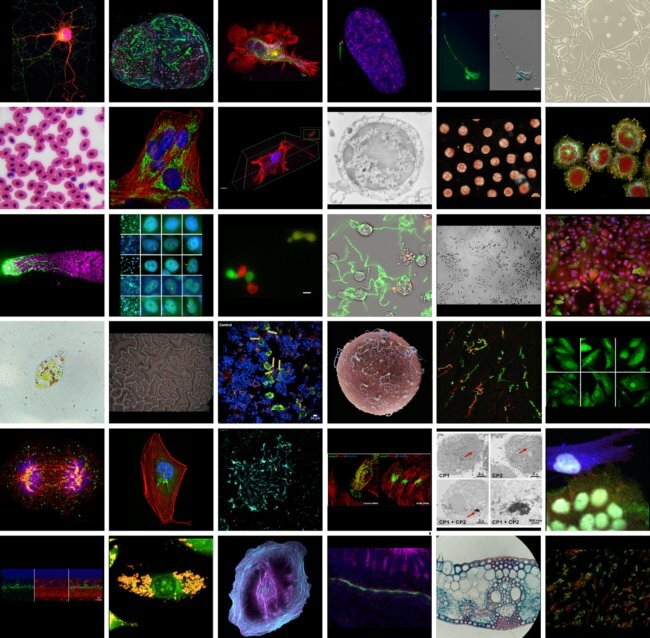 The unique shape dynamics are explained by the cell having been imaged alive, and we all know that live cells are amazing! Her fondness for microscopy is apparent based on her experience on creating micro-fabricated environments to observe cells with various methods. These impressive skills and her deep understanding of organelles are only the tip of the iceberg. 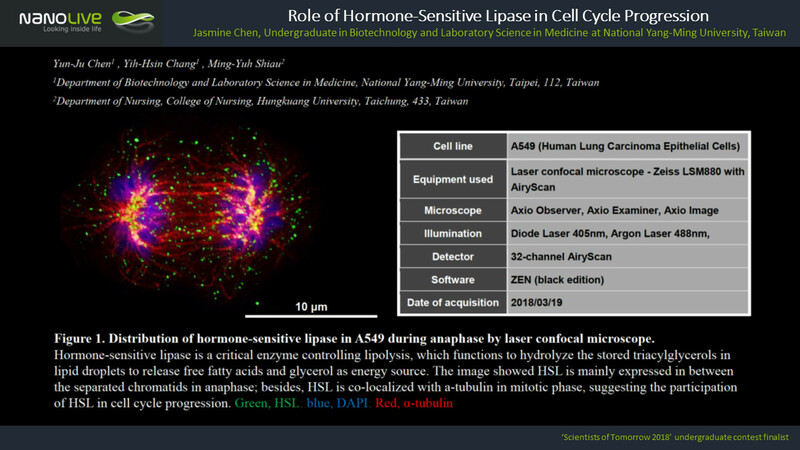 Overall, Valentina’s submission was extremely professional, providing a beautiful cell image which was appropriately annotated, accompanied by a well-structured motivation letter leaving us no doubt that she is our ‘Scientist of Tomorrow’! Congratulations! It’s a ‘smart’ choice to submit an image of a neuron. 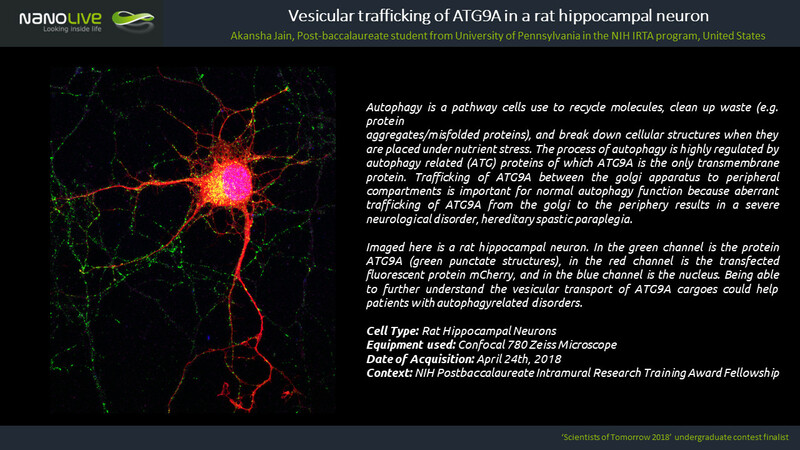 The beautiful axonal network punctuated by the small vesicles transmits an electric energy through the screen. Akansha took the term “blood, sweat and tears” literally during her young but extensive scientific journey. With worn-out hands, she took the initiative to search for possibilities to overcome the limitations of a frustrating and time-consuming experiment, demonstrating dedication and perseverance. Besides her impressive scientific abilities, we admire her genuine compassion for patients which pushed her into the direction of biomedical research. Congratulations! Zuzana’s picture is self-explanatory. 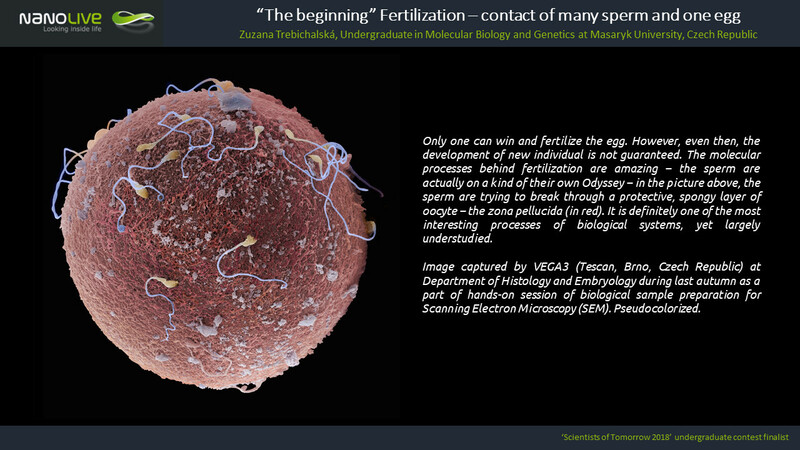 We were astounded by her textbook-worthy image of the first cell-cell interaction that one could capture: fertilization. Besides the aesthetics, obtaining such an image requires substantial preparation and precision. These skills coupled with patience and commitment are some amongst many of Zuzana’s attested strengths which caught our attention. Congratulations! The natural symmetry and cosmic appearance of Jasmine’s cell division image made it stand out, and even won the heart of the public having received the most votes! The research she participated in about regulation of cell cycle progression opens the door to many intriguing concepts with lots left to be discovered! It was inspiring to read about her determination and eagerness to learn. Congratulations! 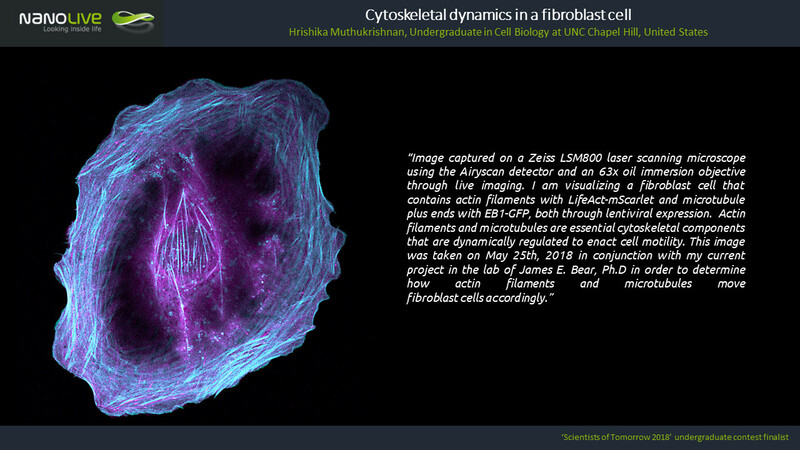 Hrishika’s single-cell image aesthetics were what initially caught our eye with the vibrant and unique choice of colours. 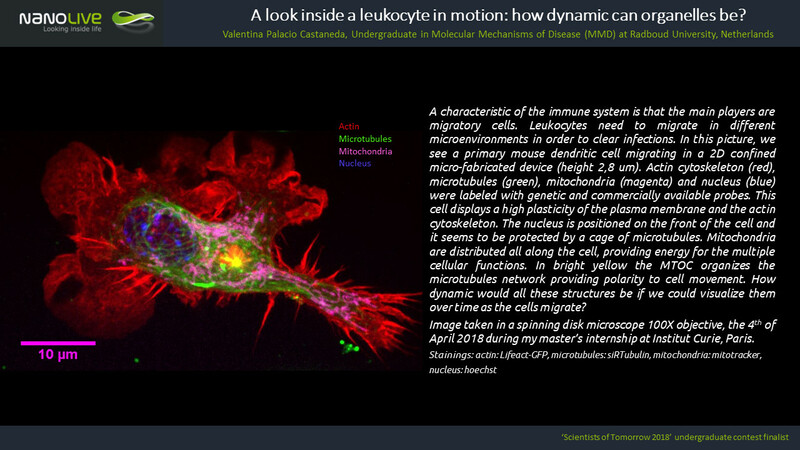 The choice of image captured from a time-lapse of a dynamic intracellular process brought up interesting discussions on cell motility. We are not only impressed by her motivation for cellular imaging but also by her drive to take on challenges, readily taking research a step further by asking “what next?”. Congratulations! Nanolive says THANK YOU to all the Scientist of Tomorrow participants. We are overwhelmed by the amount of applications and beautiful images we received.